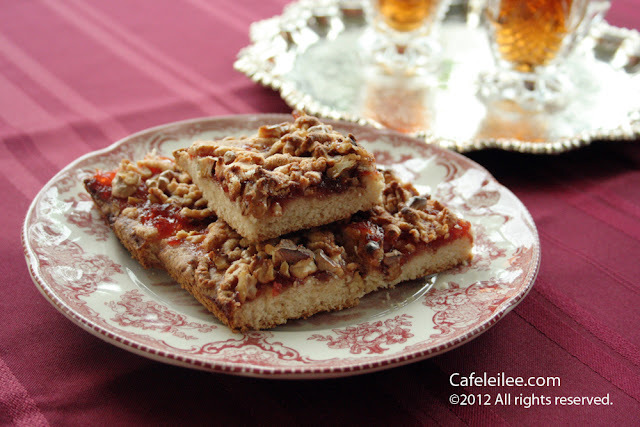 These past few days it's been raining crazy here in the Bay Area, and this gave us the best excuse to stay indoors and enjoy comfort foods followed by tea with these quince bars. Line a 10 by 17 inch baking sheet with a silicone baking mat or parchment paper. In the bowl of an electric mixer fitted with a paddle attachment, mix together the eggs, sugar and vegetable oil for about 5 minutes. Add flour and baking powder and mix until just combined and a dough is formed. Reserve a small ball (the size of an small orange) of the dough and spread the rest on the baking sheet. Spread the jam over the dough, then sprinkle with cinnamon and chopped walnuts. Grate the remaining dough over the jam. Bake for about 30 to 35 minutes. Transfer to a wire rack and let it cool slightly, the cut into 2-inch cubes. این چند روز گذشته اینجا بارون انقدر باد و بارون اومد که ترجیح دادیم این آخر هفته گذشته رو تو خونه بمونیم. با وقت اضافه ای که داشتم این شیرینی ها رو درست کردم که جای شما خالی با چای داغ خیلی چسبید. *تو کافه لیلی ما معمولا به مربا به رو رانده میکنیم و در این صورت مربا راحت تر پخش میشه، ولی اگر مربا شما نگینی خرد شده میتونین مربا رو توی مخلوط کن نرم کنید. فر را روی درجه ٣٥٠ فارنهایت یا ١٧٥ سانتیگراد روشن کنید تا گرم شود. روی سینی فر (حدود ٢٥ x ٤٣ سانتیمتری) کاغذ روغنی بکشید. تخم مرغ و شکر و روغن را با همزن به مدت ٥ دقیقه خوب هم بزنید. پکینگ پودر و آرد را اضافه کنید و انقدر مخلوط کنید تا خمیر فرم بگیرد. یک گلوله به اندازه یک پرتقال کوچک را از خمیر کنار بگذارد، و باقی خمیر را روی سینی فر پهن کنید. مربا را روی خمیر پخش کنید و گردو و دارچین را روی مربا بپاشید. خمیر باقی مانده را با رنده روی شیرینی رنده کنید. شیرینی را توی فر به مدت ٣٠ الی ٣٥ دقیقه بپزید. سپس از فر خارج کنید و بگذارد کمی خنک شود و به مکعب های ٥ در ٥ سانتی ببرید. Nice blog and a really great post...I love this kind food and this recipe sounds and looks so good that it makes my mouth already watering. Can't wait to try this recipe since I've never had this before. Looks and sounds like the perfect thing to eat with my afternoon tea. If you have a recipe like this but the only thing that keeps you from doing it is the foreign language use a professional translation service for the translation so that you won't miss out on a delicious dish.